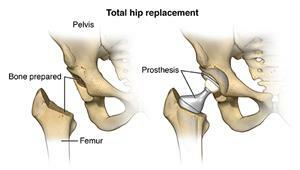 Hip replacement (total hip arthroplasty) is surgery to replace a worn out or damaged hip joint. The surgeon replaces the old joint with an artificial joint (prosthesis). This surgery may be a choice after a hip fracture or for severe pain because of arthritis. Osteoarthritis. This is a degenerative joint disease that affects mostly middle-aged and older adults. It may cause the breakdown of joint cartilage and adjacent bone in the hips. Rheumatoid arthritis. This type of arthritis causes inflammation of the synovial lining of the joint. It causes extra synovial fluid. It may lead to severe pain and stiffness. Traumatic arthritis. This is arthritis is caused by an injury. It may also damage the hip cartilage. The goal of hip replacement surgery is to replace the parts of the hip joint that have been damaged. It also helps relieve hip pain that can’t be controlled by other treatments. A traditional hip replacement involves an incision several inches long over the hip joint. A newer approach uses 1 or 2 smaller incisions to do the surgery. This is called minimally invasive hip replacement. But the minimally invasive procedure is not suited for all people who need hip replacement. Your healthcare provider will figure out the best procedure for you. Why might I need hip replacement surgery? Hip replacement surgery is a treatment for pain and disability in the hip. Osteoarthritis is the most common reason for hip replacement surgery. Osteoarthritis causes loss of joint cartilage in the hip. Damage to the cartilage and bones limits movement and may cause pain. People with severe pain from degenerative joint disease may not be able to do normal activities that involve bending at the hip. These activities include walking and sitting. 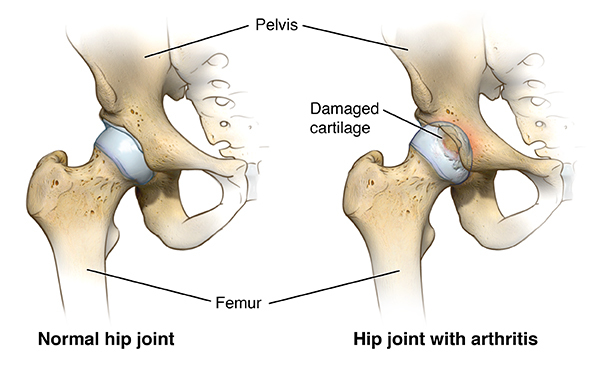 Other forms of arthritis such as rheumatoid arthritis and arthritis that results from a hip injury can also damage the hip joint. Hip replacement may also be used to treat certain hip fractures. A fracture is an injury often from a fall. Pain from a fracture is severe. Walking or even moving the leg causes pain. Your healthcare provider may have other reasons to recommend a hip replacement surgery. What are the risks of hip replacement surgery? You may have other risks depending on your specific health condition. Discuss any concerns with your healthcare provider before the surgery. How do I get ready for hip replacement surgery? At Halifax Health - Center for Orthopedics, patients undergoing a hip or knee replacement are required to take a Hip and Knee Replacement Pre-op class prior to surgery. To learn more please contact our Orthopedic/Neuro Navigator, Michelle Ransom at michelle.ransom@halifax.org. This will give you a greater understanding of what the surgery entails, as well as pre-op and post-op information. In addition to a complete health history, your healthcare provider may do a physical exam to make sure that you are in good health before having the surgery. You may have blood tests or other diagnostic tests. Tell your healthcare provider if you are sensitive to or are allergic to any medicines, latex, tape, and anesthesia (both local and general). Tell your healthcare provider about all medicines you are taking. This include prescription and over-the-counter medicines, and herbal supplements. Tell your healthcare provider if you have a history of bleeding disorders or if you are taking any blood-thinners (anticoagulants), aspirin, or other medicines that affect blood clotting. You may need to stop taking these medicines before the surgery. You will be asked to fast for 8 hours before the surgery. This usually means after midnight. You may get medicine (sedative) before the surgery to help you relax. You may meet with a physical therapist before your surgery to talk about rehabilitation. If you smoke, stop before your surgery. Smoking can delay wound healing and slow down the recovery period. Do conditioning exercises as prescribed to strengthen muscles. Based on your health condition, your healthcare provider may order other specific tests or exams. Hip replacement usually requires a stay in a hospital. Procedures may vary depending on your condition and your healthcare provider's practices. Hip replacement surgery is done while you are asleep under general anesthesia or sedated under spinal anesthesia. Your anesthesiologist will discuss this with you before the surgery. A urinary catheter may be inserted after you are asleep. The anesthesiologist will watch your heart rate, blood pressure, breathing, and blood oxygen level during the surgery. The healthcare provider will make an incision in the hip area. The healthcare provider will remove the damaged parts of the hip joint and replace them with the prosthesis. The hip prosthesis is made up of a stem that goes into the thighbone (femur), the head joint (ball) that fits into the stem, and a cup that is inserted into the socket of the hip joint. The stem and cup are made of metal. The ball may be made of metal or ceramic. The cup has a liner that may be made of plastic or ceramic. The 2 most common types of artificial hip prostheses used are cemented prostheses and uncemented prostheses. A cemented prosthesis attaches to the bone with surgical cement. An uncemented prosthesis attaches to the bone with a porous surface. The bone grows onto this surface to attach to the prosthesis. Sometimes a combination of the 2 types is used to replace a hip. A sterile bandage or dressing will be put on the site. After the surgery you will be taken to the recovery room to be watched. Once your blood pressure, pulse, and breathing are stable and you are alert, you will be taken to your hospital room. Hip replacement surgery usually requires you to stay in the hospital for several days. It is important to begin moving the new joint after surgery. A physical therapist will meet with you soon after your surgery and plan an exercise rehabilitation program for you. Your pain will be controlled with medicine so that you can participate in the exercise. You will be given an exercise plan to follow both in the hospital and after discharge. You will be discharged home or to a rehabilitation center. In either case, your healthcare provider will arrange for continuation of physical therapy until you regain muscle strength and good range of motion. You may go back to your normal diet unless your healthcare provider tells you differently. Don't drive until your healthcare provider tells you to. You may need to limit other activities. Full recovery from the surgery may take several months. It is important that you don't fall after your hip replacement surgery. A fall can damage the new joint. Your therapist may recommend an assistive device such as a cane or walker to help you walk until your strength and balance improve. Stable chair with firm seat cushion and firm back with two arms. This will let your knees to be lower than your hips. Remove loose carpets and electrical cords that may cause you to trip. Your healthcare provider may give you other instructions after the surgery, depending on you need. With our unique Enhanced Recovery After Surgery Program, Halifax Health patients are not only receiving exceptional care from our expert team, but will have the peace of mind that when their surgery is over they can return to doing what they love. Halifax Health patients receive special care from the Area’s ONLY Orthopedic/Neuro patient navigator before, during and after surgery. For more information or to schedule a tour call 386.425.0611 and speak to our Orthopedic/Neuro patient Navigator.